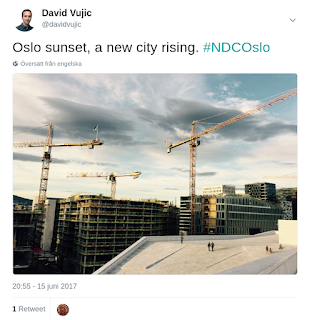 The sessions from NDC Oslo 2017 are online! I had a good time in Oslo, got new insights and left the Norwegian capital with inspiration. There were many interesting talks and lots of fellow geeks to chat with. I am also glad that so many people joined my talk. Thank you! I hope you have learned something useful. Click the Youtube "Like" button if you like it! Also, I would very much appreciate your feedback. Please write your feedback at the comments section of the Youtube page (or this blog post) if you come up with ideas, questions, suggestions or things that should be improved.